Sterling & Tucker would like to welcome everyone to the year 2019. On Friday, December 14, Sterling & Tucker had a Holiday Party at Willow’s. On Wednesday, October 31, Sterling & Tucker enjoyed an office potluck to celebrate Halloween. On Thursday, April 12, 2018 at 10:00 am, attorney Lauren Sheppard will present our Trust Review Seminar at Maui Arts & Cultural Center. Directly following the seminar, Sterling & Tucker will host a meet and greet to enable our current and prospective Maui clients to meet with both Lauren and attorney Michelle Scully Hobus, who currently works with our Maui clients. Lauren will be scheduling Maui appointments starting on April 18, 2018. As the new year approaches, we look forward to some exciting changes. Sterling & Tucker, LLP, will be relocating our office, February 2016. Our new office will be located at the City Financial Tower, a block from our original office. Our first official day in the new office will be February 8th, 2016. Please make note of the new address. 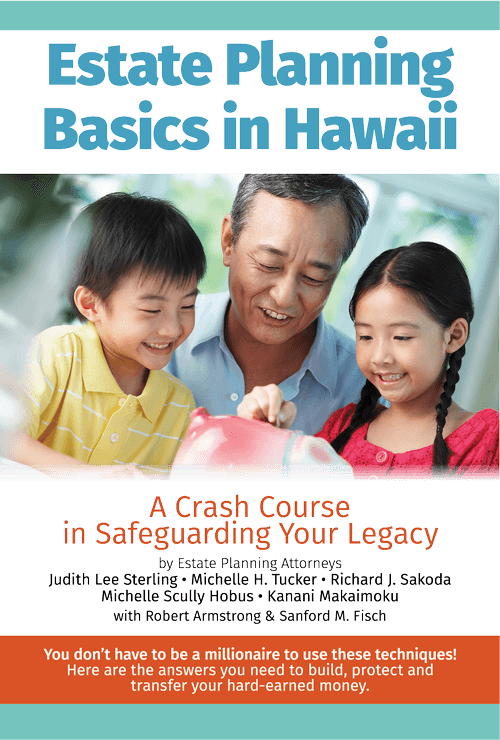 Our Estate Planning Basics in Hawaii book, written by our very own estate planning attorneys at Sterling & Tucker, is available for purchase. Stop in the office to purchase your copy, for only $20.00. (Mailed copy available, add $6.00 s+h). Divorce is never easy. Picking up the Pieces After Divorce, gives empowering strategies on how to feel more in control of your estate plan and finances post wedlock. Michelle Scully Hobus, Elizabeth Ubaldo, and Jennifer Henson attended the American Academy of Estate Planning Attorneys 2014 Spring Summit in Houston, Texas. The American Academy of Estate Planning Attorneys requires members to complete 36 hours of continuing education credits each year to maintain membership in the academy. The summit events provide an opportunity for attorneys to attend classes that help meet the continuing education credits requirement. The summit events also give the attorneys a chance to meet with other attorneys to share ideas and success stories. Staff members get the opportunity to meet peers in other law offices from around the country and share what works or does not work in their offices. Staff members receive training in software, database management, marketing, and social media. Wendy Miki Glaus participated along with 59 other runners from Hawaii in the recent 2014 Boston Marathon. She finished the marathon in 3:46:32. Way to go Wendy!! Wendy Miki Glaus, along with 40 other athletes from Hawaii, competed in the Cozumel Ironman in November. Wendy finished 3rd in her division out of 47 females from around the world! We are very proud of Wendy!! Here is the link for a story featured in Midweek Magazine. This fall we welcomed associate attorney Kanani Makaimoku and paralegal Susie Graeb to Sterling & Tucker LLP. Our very own Wendy Miki Glaus participated in the recent 2012 Honolulu Marathon held on December 9, 2012. Our mission is to arm consumers and professional advisors in our community with the information needed to make informed decisions about their family’s and client’s future. With that purpose, we are pleased to announce the rollout of our new and improved Estate Planning website! Judith Lee Sterling and Michelle H Tucker were featured on the Founders & Visionaries Wahine Edition which aired November 19, 2011 and again on December 3, 2011. While using her leadership skills to manage our business through a struggling economy, Michelle H. Tucker has at the same time earned two prestigious awards this year. Adding to her many achievements, Michelle continues to propel in excellence in various facets of her life.